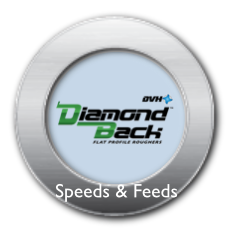 This page provides an overview of Speeds and Feeds to help you understand the terminology and usage. To get specific Speeds and Feeds for Destiny Tool Products just click the buttons below. Cutting speed is the speed in linear feet per minute or "Surface Feet per Minute" (SFM) that a given tooth (flute) on the cutter will be moving when it cuts through the material. All materials have a documented SFM or "cutting speed". Think of it like a minimum and maximum speed limit on a highway. Some roads you can go faster on and some roads you must go slower on. If you've ever had the pleasure of being asked by an officer of the law "How fast where you going?" 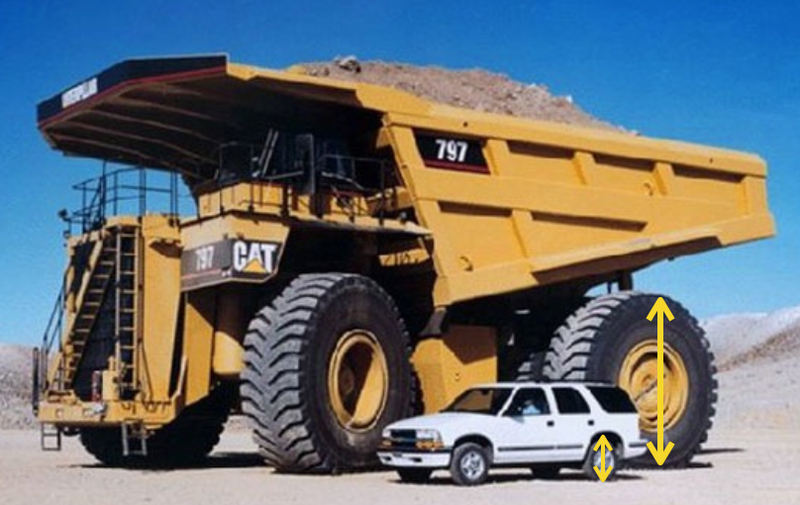 you probably wouldn't say "My tires are 22" diameter and they where going 1,978 RPM". 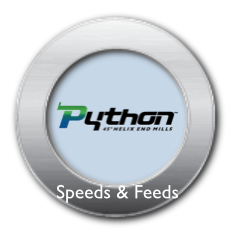 Similar to MPH, SFM is a constant and when we talk about cutting speed we're referring to SFM. 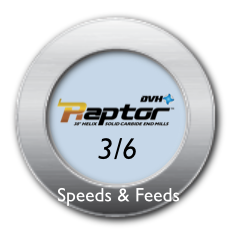 The phrase "speeds and feeds" (or "feeds and speeds") refers to two separate velocities in machine tool practice: cutting speed and feed rate. They are often considered as a pair because of their combined effect on the cutting process. SFM - Also called surface speed or simply speed is the speed difference (relative velocity) between the cutting tool and the surface of the workpiece it is operating on. It is expressed in units of distance along the workpiece surface per unit of time, typically surface feet per minute (sfm) or meters per minute(m/min). IPR - Also called, feedrate, or called simply feed) is the relative velocity at which the cutter is advanced along the workpiece. The units are almost always distance per spindle revolution (inches per revolution [in/rev or ipr] or millimeters per revolution [mm/rev]). IPT - Also called Inch Per Tooth, chip load per tooth (CLPT), or simply chip load is the amount of material being removed by each flute of the cutting tool per revolution. for more information SEE "Chip Formation"
RPM (abbreviated: rev/min, r/min, or r·min−1) is a measure of the frequency of a rotation. It annotates the number of turns completed in one minute around a fixed axis. It is used as a measure of rotational speed of a mechanical component. When someone asks you "How fast are you going?" when driving your car, they aren't asking for the RPM of your tires but your MPH. Similarly, when we ask "What's your speed?" we are talking about Surface Feet per Minute, or SFM, because, all material, jus tike highways have a minimum and maximum surface footage. SFM is a constant. RPM is a variable based upon diameter. SFM is a combination of diameter and the velocity (RPM) of the material measured in feet-per-minute as the spindle of a milling machine. The faster the spindle turns, and/or the smaller the diameter, the higher the SFM. The goal is to tool a job to run the SFM as high as possible to increase hourly part production. Materials will run better at specific SFMs. The actual surface footage can vary according to the rigidity of the work holding and the runnout of the toolholder/cutting tool interface. If you've been in the metalcutting industry long enough you may have met a classically trained machinist who could calculate RPM in his head faster than you could on a calculator. Here's how he did it. Back in the days of belt driven milling machines and slide rules, the old school machinists had a simple method of calculating RPM. They used the formula CSx4/D. As we said above, Material Cutting Speed is not RPM. All materials have a documented cutting speed which today we refer to as SFM. Back in the old days they called this "CS" short for "cutting speed". CS and/or SFM is a constant for materials. Again, think of it like a minimum and maximum speed limit on a highway. 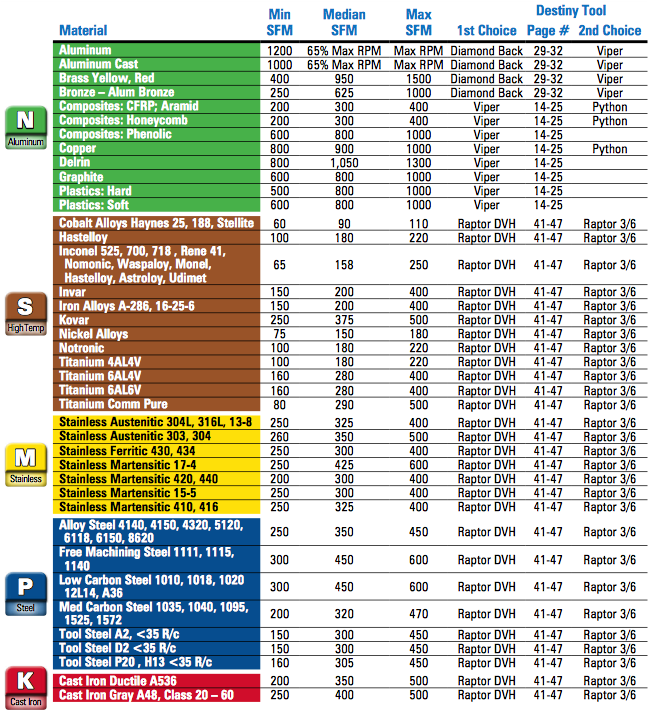 To find approximate RPM the old machinists would follow the formula: RPM=(CSx4)/D which is essentially the same as what we use today: RPM = SFM X 3.82 ÷ Tool Diameter, just without the division. So simply put: Multiply the SFM by 4 and then divide the result by D.
What the machinists realized is that SFM is a formula based upon a 1" diameter. They realized that 4 was a constant so they multiplied the SFM constant by 4 to get the RPM for a 1" tool (200 SFM X 4 = 800 RPM) and multiplied the SFM by 8 (200 SFM X 8 = 1600 RPM) for a 1/2" tool. A 1/2' tool is one of the most common sizes of end mill used in the metalcutting industry. If you just remember the constants you can quickly get to a RPM starting parameter without the need for a calculator!